If it was not for the black eyes and beak on this Willow Ptarmigan that walks across the tundra of Churchill, Manitoba, one may never see him. This bird has plumage that turns snow white in the winter as a means of camouflage but come summer, the Willow Ptarmigan has a reddish brown coloring to him. 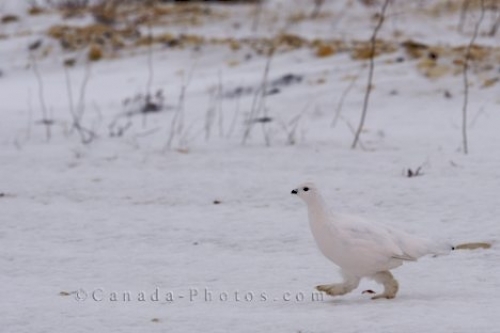 Picture of a Willow Ptarmigan bird crossing the snow covered tundra in the Churchill Wildlife Management Area in Manitoba.